making it really convenient for computer users. INTRODUCTION TO "COCOON GUEST HOUSE"
Our goal is to provide a safe, comfortable and supportive environment for our healing guests. We do not provide any nursing care but are nurses that care. We work as Operating Room nurses at the Davies Campus on alternate days so one of us is available for the house. We reside in the house and are available by cell phone. 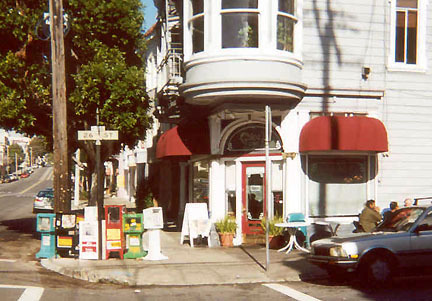 The guesthouse is located in Noe Valley, a community oriented and culturally diverse neighborhood. Public transportation to the hospital and other noteworthy tourist sites is within one block of the house. Unlike much of San Francisco, the neighborhood is flat lending itself to healing walks. Restaurants, grocery stores and most conveniences are located within walking distance of the guesthouse. Detailed local and downtown maps are available for guests. No Smoking is allowed on the premises, including the garden. Each guest is provided with a lock box for valuables; however we suggest leaving valuables at home. Small closets are available; we strongly suggest comfy lounging clothes. Help with the first hair washing is offered. Keyless door locks allow for easy guest access. The garden is for all to enjoy. 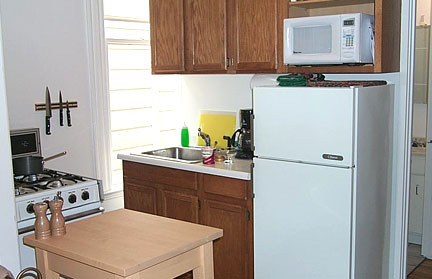 Laundromats and wash-and-fold laundry services are available close to the house. Street parking is zoned for 2 hour limit so it's best to leave your car at home. If you must drive, read the signs for street cleaning and watch for driveway blocking�people do tow!! We do not provide transportation; local taxi companies are providing prompt service. Each guest stay (whether a single or double) must be booked through Mira in Dr. Ousterhout's office. The house is in its 5th year of operation, and we wish to thank all the souls present, past and future for passing through these four walls. It continues to be a place of positive, caring and supportive wonder!!! The layout of "COCOON GUEST HOUSE"
A rear garden apartment, "A" accessed down a walkway to the left of the house is a one bathroom with shower only, hair dryer supplied. A fully equipped kitchen complete with blender, microwave, coffee maker, fridge and stove is stocked with foodstuffs and liquids suitable for those healing from FFS surgery. A queen size bed and single day bed with lots of pillows and blankets make a homey environment. 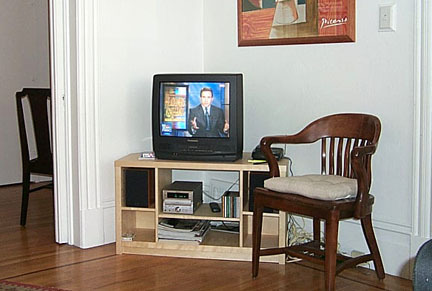 Amenities include TV/VCR, CD player, and phone with local service. French doors lead to the garden patio. 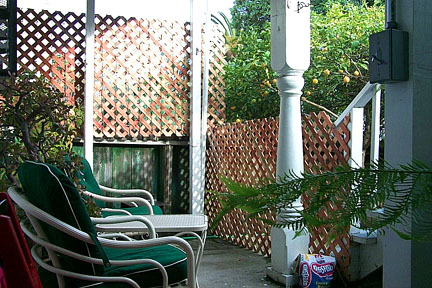 This south-facing patio is often sunny, since the Noe Valley area has less fog than most of San Francisco. The other apartment, " B FRONT" and "B BACK", is accessed via the main front door through the foyer to the left. 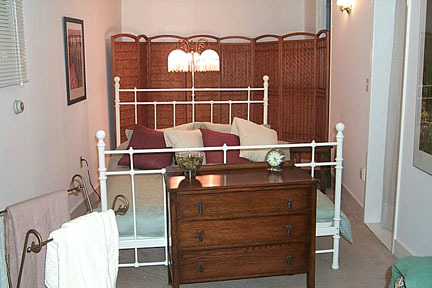 The door opens to a large room with 2 single day beds complete with pillows and blankets. 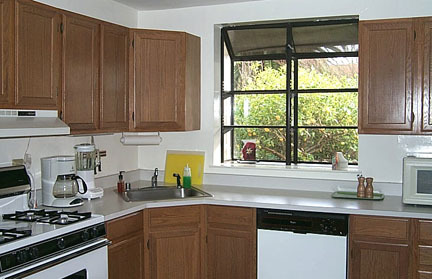 Continuing through is a fully equipped, stocked small kitchen and eating area. There is a bathroom with shower only, hair dryer supplied. Continuing through is another large room with 2 single day beds. Pocket doors and curtains create privacy. Each room has TV/VCR, CD player, and phone with local service. Access to the garden patio is via the walkway leading down to the left of the house. This apartment can be busy, it is a shared space! We are hearing from guests that "there is comfort knowing someone is closeby". This section contains diaries, notes and photographs from some of Dr. Ousterhout's patients who have recently stayed at Cocoon House. We all hope that these items help other women visualize what the experience will be like at Cocoon House, and will help them plan their stays there. Located at 3877 Cesar Chavez Street near Church Street in the Noe Valley neighborhood, Cocoon House is all you could ask for and then some while recovering from surgery. Cocoon House is owned and operated by 2 wonderful women, Mary-Lou and Tricia. Both are nurses at Davies Medical Center, in fact Tricia was part of the surgical team that performed my surgery on January 19th, 2001. 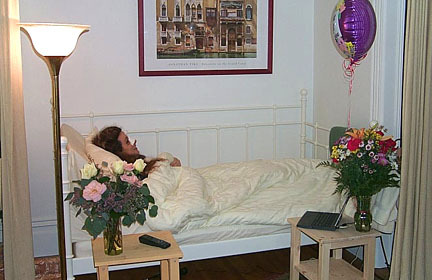 Although they are not legally allowed to provide nursing care on-site, their many years of nursing experience uniquely qualifies them to know if and when the doctor should be notified. They are always in close contact with Mira and Dr. Ousterhout should you need any professional care at any time. You will find the refrigerator and cabinets stocked full with soft foods like jello, apple sauce, oatmeal, soups, ice cream and more. You'll also find lots of liquids like apple juice, orange juice, cranberry juice, milk, and bottled water. They make a daily visit to replenish food, sheets and towels. If you should find that you need something that isn't available, just ask and in most cases they will find it for you. I casually mentioned that I was bummed that I couldn't eat the ice cream that was in the freezer since I don't do dairy. Later that day they showed up with Haagen-Dazs Chocolate Sorbet. Oh happy day! I found the beds to be comfortable although some may find sleeping in a partially upright position on the wedge something to get used to. The sleeping position is doctors orders however to keep too much blood pressure from the face. I found that a pillow under my head, another under my lower back and a cushion under my knees to work perfectly and there is no shortage of either pillows or cushions. All of the outside doors are controlled by 4 digit code given to you when you arrive so that you don't have to worry about carrying a key. The rooms have individual baseboard heaters so that you can adjust the climate to your own liking at any time. I had the pleasure of staying in apartment B, upper level, front for six nights. At any given time, though Apt B has 4 beds, there were between two and three of us living there. The thing I liked most about staying at Cocoon House was getting to know other girls. We were all in the same boat.....transsexual, packed and taped up from Dr. Ousterhout surgery, and having many stories to tell about our transitions. In my case, I made one very special friend, and I'm sure that friendship will last the rest of our lives. Cocoon House is a good place for post-ops to be uncomfortable together, as we daily compared notes on our recoveries, and encouraged one another. Rarely did we watch television. We were too busy socializing or sleeping. It is a quiet place, and I had no problem resting and sleeping when I needed it. Since I had my car with me, and had found San Francisco to be a very difficult city to park in (especially long term), I was pleasantly surprised to find ample unstreet no-limit parking right in front of Cocoon House. For six days, parking was not an issue for me. For any of you that will have a car to contend with, this can be an important item to consider. 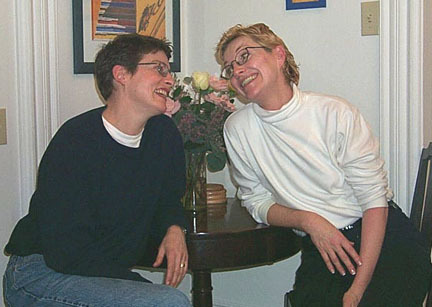 Tricia and Mary-Lou (ML), the owners, are sweethearts from the word go. They are extremely energetic and fun. I personally enjoyed every minute of their company. They had no problem stopping in and yacking forever, and they were a joy. During my first post-op appointment with Mira, ML stopped in Dr. Ousterhout's office just to see how I was doing. A few days later, when I was having the final facial hardware removed at Dr. Ousterhout's office, Tricia came in the room and helped Mira give me advise on hair fashion. These are two great landladies. ML took the time and effort to wash the blood out of my hair. We had fun with that, and joked around the whole time. That is probably more than my mother would have done for me, as it was gross. Laura Ann DeVries did a great job describing the inviting atmosphere of 24th Street. I personally spent a several hours roaming the area, and agree that 24th Street has everything to offer. I found a nice laundromat on the corner of 24th and Church, where I caught up on my dirty laundry. For most, laundry isn't an issue, but I had driven in from Michigan, and had been traveling for two weeks...so it was time to rejuvenate some underwear. My roomate, Melissa, and I took a walk to Lovejoy's Tea Room which is 2-1/2 blocks from CH. Both of us had the classic "X" bandages on our faces, and I'm sure all the other women in the place considered us quite a spectacle. But we didn't care. We ordered tea, which tasted great to our dried up mouths, and had orange and shrimp sandwiches, which were decrusted and soft. Soft is important post-op. Anything that has to be chewed is outlawed. I found that Lovejoy's sandwiches could be gummed quite easily. 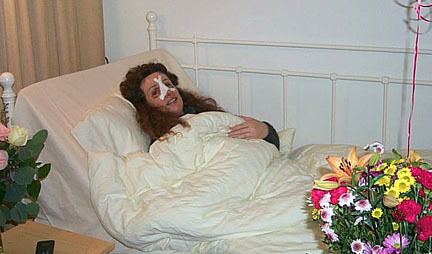 One thing I found about the Noe District is that, in spite of my "X" bandaged face, everyone was very friendly. I had absolutely no problem wherever I went. If someone looked at me twice, I just offered a big smile and a hello. It was always returned. Hey, isn't that what life's all about? In summary, I would go back to Cocoon House in a heartbeat. In fact, I plan on returning for another forehead advancement and total facelift in August, and I will be once again a resident of Cocoon House. 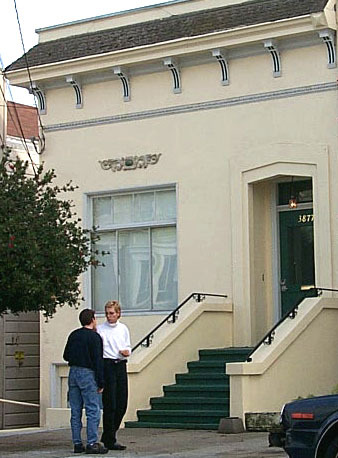 Cocoon Guest House is located at 3877 Cesar Chavez Street, near the corner of Cesar Chavez and Church Streets, in the Noe Valley district of San Francisco. The residence is about 1-3/4 miles SSE of Davies Hospital. The maps below show the relative locations of Cocoon House and Davies. For convenience, especially during early recovery, many patients use a taxi (cost is about $5.50) to go back and forth between Cocoon House and Davies. However, there is also good access to public transportation from Cocoon House. By walking 2-1/2 long blocks west to Noe Street, you can get the Number #24 busses that travel north onto Castro Street and thence on to Davies Hospital. The bus stop at the hospital is on top the hill, so little up/down hill walking is required. Cocoon House is also within easy walking distance Muni "J-Line" light rail transit on Church Street. The closest stop is at Church and 27th Street, just one and a half short blocks away. 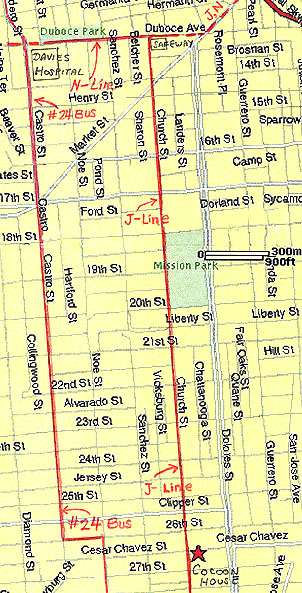 The J-line runs north/south on the surface of Church Street until it gets to the intersection of Church and Duboce Streets near the Safeway supermarket in the Castro District. There it turns NE and joins the N-line, heading towards downtown as a subway underneath Market Street. Therefore, the J-Line provides very easy access to downtown San Francisco. (The J-Line runs every 10 min on weekdays and every 20 min on weekends). Davies Hospital can also be reached from Cocoon House via the J-line by getting off at the Safeway supermarket (just before Duboce Street), and then either taking the Muni N-line west on Duboce to Davies, or walking that last section (note: although it's only a five block walk, most of it is steeply uphill). Cocoon House is located 1-3/4 miles south southeast of Davies Hospital, in the Noe Valley section of San Francisco. Like the rest of the city, Noe Valley has its share of restaurants and local ambience. Noe Valley has been area of active urban renewal and gentrification. 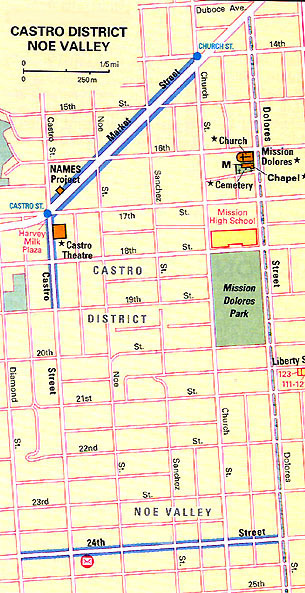 Because of this, the 24th street merchant strip is a thriving and diverse street that spans approximately eight blocks, beginning at Church street and tapering off just after Castro street (as indicated in the map above). This area has several things to offer the recovering patient: It is relatively close to Cocoon House (five short blocks), the terrain is reasonably level, and the merchants and restaurants are both diverse and offer a range of prices and services. To get there one only has to walk less than half a block west on Cesar Chavez (used to be called Army Street) where Casa is located to Church street, turning right (north) onto Church and then walk five short blocks to 24th street. As you approach 24th street on Church you encounter a slight gradient which can be negotiated by most patients. Turning left (west) onto 24th street reveals eight blocks of merchant, retail, and restaurant services. You should be able to find anything you need here during your stay at Cocoon House. Most area restaurants are sit-down restaurants of small to medium size, however there are a small number of restaurants that will deliver to your door. Mary-Lou and Tricia are working on assembling a list of restaurants for reference and use by visiting patients. Very small ma and pa owned super-market with a little bit of everything just one quarter of a block from Cocoon House. Hours 8:00 to 8:00pm. Excellent Chinese food. Moderate prices. Fast Service. One and half blocks from Cocoon House. Small very cozy tea room filled with antiques, delicate tables, and white linens offering a large repertoire of teas and sandwiches. Open daily for afternoon tea soothing the beast in us all. Two and half blocks from Cocoon House. Small video rental store with sufficient titles to please most. Fast friendly service. Travelers and transients are welcome. Hours 10 - 10pm ? This juice bar offers a ride variety of slush's, freezes, smoothies containing yogurts, fruits, and health giving herbal additives. $3.50 - 4.50 Hours: 10 - 10pm ? In addition 24th street sports a variety of shoe and clothing retailers, 2 hardware stores, several branch banks and or ATM machines,Laundromat, antique and stained glass merchants, two coffee shops, cheese purveyor, bagel shops, toddler and toy shops and a variety of other small merchants and retailers set among a local neighborhood setting. From our experience all the merchants we encountered were friendly and helpful, but also a little puzzled over us "X-people" and our worn-looking faces!